This brief guide will explain how to boost the volume for music playing in Spotify on your Android phone or tablet. In order for the volume adjustment to work, first you’ll need to pause any currently playing tracks. Then tap the Your Library icon from the bottom navigation bar. When the Your Library window opens, tap the Settings icon in the upper-right corner (see screenshot below). Scroll down the Settings window until you get to the Volume level row. On the far right side of that row there’s a ‘pull-down’ menu (which is probably currently labeled Normal) – tap it. 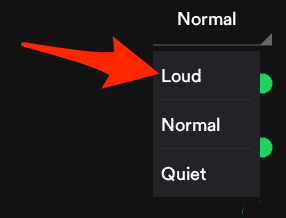 This is a good guide for you if you are in to increase the volume in spotify. And this is really effective as i have already found them useful and helpful.